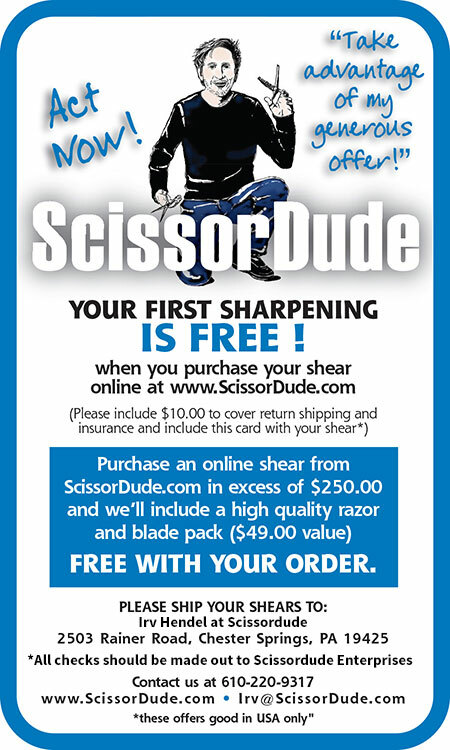 Scissor sharpening is $40.00 and includes return postage. Shears will be serviced and returned promptly. Your email address in case we cannot contact you. A clearly written return address and contact phone number. Shipping labels for USPS should be addressed in your very best handwriting and attached securely so that tag does not fall off. Please Note: WE DO NOT ENDORSE NOR DO WE RECOMMEND USING THE UNITED STATES POST OFFICE TO SHIP VALUABLE SHEARS. They have lost several of our packages and do not honor their insurance agreements. We recommend using UPS or Fedex. Even if you pay a little more their tracking system is much more reliable. PLEASE MAKE ALL CHECKS TO SCISSORDUDE ENTERPRISES. There may be additional charges if package is shipped to a residence. Please Note that packages shipped to your salon are less likely to get lost. Please add $10.00 for 2nd day air delivery. Connected states can be shipped ground as they usually arrive here in one day. *Please note that aggressively ground down shears may not be sharpenable.